I bought a Taurus PT145. I’m still working on a better set of sights, but it’s basically running just fine now. Recently, I bought a pocket holster, the “Pocket Grabber” by High Noon, from our friend, Syd at “The Sight Quartermaster”. It is an ambidextrous design which has a pebble-grain rubber outside that grabs the pocket material and releases the gun on the draw-stroke. It works great. Today, I had the opportunity to test the system. Since it was in the high 70’s, I didn’t feel like wearing a cover garment. I went shopping and had lunch. The Taurus and 10 rounds of 230gr. Hydra-Shok rode in my left front pocket. After I got used to the weight being there, instead of on my belt, it went quite well. Truck entry and egress was easy. I did some bending and poking at the Home Depot. After I got home, I did a little yard work, and the little gun is still in my pocket as I type. Pretty nice set-up, IMHO. I have a feeling that next summer is going to be a little more comfortable. Press gun and holster against pant leg. At this point, the rubber exterior will grasp the pocket (it doesn’t have a choice) and if you keep pulling, the gun will come out of the holster. The holster should not move upwards more then an inch. 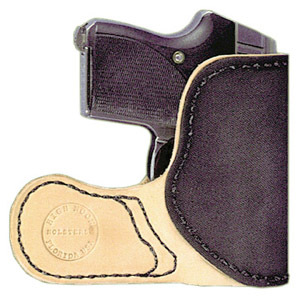 If it does you are not pressing hard enough or the holster has to break in. This product was tested to work this way. Of course, it is slower than from a Kydex IWB, but that is more than off-set by the convenience. I belong to the school that says if you’re depending upon the speed of your draw-stroke to save your bacon . . . you’re just not paying attention.